Here you can find out a bit more about us and what we do. We provide a daily collection and delivery service of internal mail for the University. We have five full time Messengers, two electric vans and three bikes. We cover all thirty one colleges, allied institutions and most Faculty and Department buildings, including Addenbrookes and Cambridge Biomedical Campus. 1. Where do you deliver to and collect from? We cover all colleges and most University Departments. For full list, please see UMS Delivery Locations (Raven password required). Some items will be delivered the same day and all usually within 24 hours. 3. Do you take larger items i.e. packages and boxes? 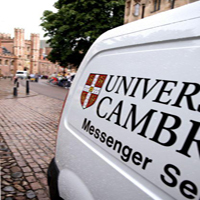 Yes, we do take packages and boxes – please call 30250 or email UMS@admin.cam.ac.uk or speak to the messenger on your route to arrange collection by van. Please ensure that each package/box does not exceed 10kg. All computers to be returned to UIS must be boxed. 4. Do you take recycling? Yes, we will take used batteries and toner cartridges (correctly packed). Please ensure that they are clearly marked for recycling. For more information on recycling visit the E&E website. 5. Can I send cash? Money is not to be sent via UMS. (Optional return address on the rear of the envelope). If the destination of your mail is unclear, a supervisor will open it to ascertain where it needs to go or be returned to. If your mail is marked ‘private and confidential’ it will be passed to a member of the management team to be opened and redirected as needed. Please make sure your mail items are packed appropriately before our team collect it. It is a departmental responsibility to ensure that confidential items are marked as such and the packaging is sufficient to prevent loss or damage. Packaging for items such as biological samples, batteries, alcohol or other chemicals will be subject to specific regulations and departments should ensure that staff who are packaging these items have the appropriate training. We offer an extremely reliable service but we are currently unable to track and trace individual items of mail and do not offer compensation for loss or damage. Your department will specify a delivery location for us – usually a reception desk or security lodge. In the case of building or departments without a staffed delivery point, post will normally be left in a designated trays for staff to collect. Staff should be mindful of the security provision within their own area and should report any concerns or needs to their local facilities/building manager. Vehicle deliveries and collections are carried out accordingly to a planned schedule. To inquire about special arrangements, and for further information about vehicle deliveries/collections, please contact us on 30250. If your department is part of a bicycle delivery round, there are limitations on how much mail can be collected. If you need support with large parcels or mail outs, please contact us on 30250 or 60957 and we will be happy to discuss your needs and will arrange a collection by one of our vehicles if possible. Operational hours are 08.30 am to 4.30 pm, Monday to Friday.